There is a huge variety of ways in which parents facilitate their child’s care and schooling. At one end of the spectrum is a child who enters non-Montessori daycare at 6-weeks-old; a caring environment, we’re sure, but not one focused on schedule that a child needs. On the other end of the spectrum is a child who is homeschooled from day one, spending very little time away from the parent all the way through high school. Every parent has their child’s best interest in mind, but they also have to deal with their own schedule. Is it feasible to stay home with the child? Does it make financial sense? Even more important, does it make emotional sense, for both the child and the parent? We realize that every family’s needs are different, and that’s why we offer three options on how long a child will be with us during the day: half-day, full-day, and extended-day program. These are available for infant daycare, toddler childcare, and our Montessori preschool; hours run from 7 am until 6 pm, depending on the timeframe chosen. Half-day serves an important role for many of our parents. Some children are willing to leave their parents for a half-day, much like traditional kindergarten but aren’t yet emotionally ready to stay with us the whole day. Other times it’s the other way around; parents just aren’t willing to be without the child all day long! Half-day Montessori care serves other needs as well. Sometimes a parent has a job that requires them to work only half of a day, and they’re more than ready to pick their child up before lunch. Other parents are busy with the school activities of older children and need a focused daycare experienced like our Montessori Academy provides. No matter the reason, we’re more than happy to provide children with the tools to become a lifelong learner. Full-day is certainly a popular option. It allows many parents to get an entire day’s work in and still pick their child up in time to have an entire evening as a family. Pick up time for full-day starts at around 3:30. This time allows most parents to work the pick-up times into the public school pick-up times for their children in K-12. Of course, it’s not all about the parents. This length of time is just right for many of our children. They have a full morning, have a break for lunch, and then some time lunch for more learning. It’s the right amount of time for learning without being away from their parent for too long. We know that not every parent is able to be back here by 3:30. Some jobs are simply too demanding to be left so early in the day, and even if a parent is able to arrange an early leave in their day, the traffic and distance can make it impossible to get here for a working parent. We offer extended-day services, just in case a parent needs to work and is unable to get here until 6 pm. Every family is different, and every family should have a daycare and preschool program that can match what they need to make their family dynamic work. 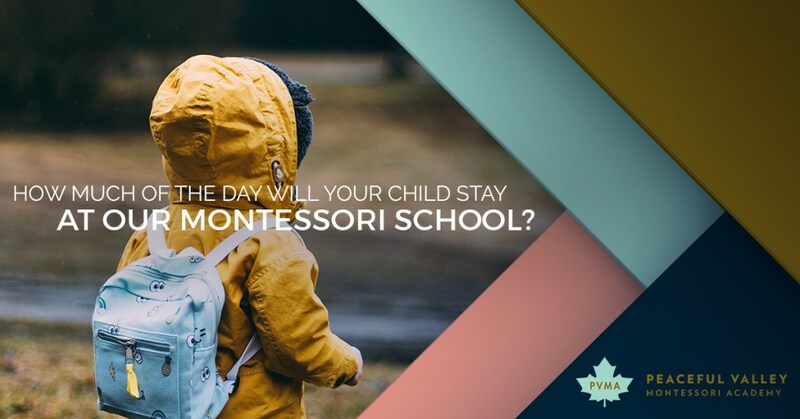 That’s why our academy offers so many different options to ensure that your family can take advantage of the Montessori method. We’d love to talk with you more so that we can help you choose which time frame works best for your schedule. Simply click this link and we’ll answer any questions you might have about our Montessori school!